In 1994, astronomers watched in awe as the comet Shoemaker-Levy 9 crashed into the planet Jupiter, creating massive fireballs exploding with the force of six million megatons of TNT—equivalent to 600 times the world's nuclear arsenal. What would have happened if it had hit Earth instead of Jupiter? "It would be the biggest destruction that mankind has ever seen," said Mel Stauffer, University of Saskatchewan geological sciences professor emeritus. "It wouldn't matter where it hit, it would affect all mankind." The subject of Hollywood movies, the reality of asteroid and comet strikes is more science, than science fiction. Most researchers believe the likelihood of a massive object colliding with Earth in our lifetime is small, but the planet has been hit before and will certainly be hit again. 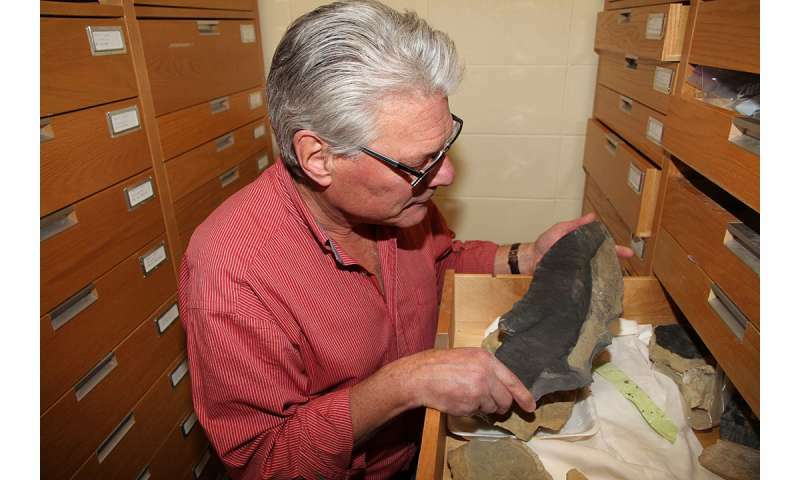 Stauffer has spent a lifetime collecting the evidence, searching for meteorites, shatter cones (rock violently fractured around the rim of impact craters) and tektites (pulverized rock liquified by the superheated temperature of an impact and blasted into the atmosphere before raining down to the surface). Stauffer said on average the Earth gets hits by a one-metre-wide asteroid about once a year, although, most burn up in the atmosphere or crash into remote regions or our vast oceans. Two of the most alarming recent events occurred in the Siberian region of Russia, including the 2013 asteroid air burst near Chelyabinsk that was reported in the journal Nature to be a house-sized object 20 metres in diameter, releasing the energy equivalent of 440,000 tonnes of TNT. "It went just past a couple of villages, including Chelyabinsk, and because it was breaking the sound barrier and exploding into pieces, the shock wave broke windows that blew up in people's faces, so about 1,500 people were hospitalized from cuts," said Stauffer. "It was the second largest event that we have been able to accurately measure." In 1908, what is believed to have been an asteroid exploded over a sparsely populated area of Siberia, flattening 80 million trees over 2,000 square kilometres of forest in what is called the Tunguska event. More than 1,000 research papers have been filed on that blast, with supercomputer simulations projecting the object to have been 60 to 190 metres wide and to have exploded with a force of up to 15 megatons of TNT (1,000 times more powerful than the atomic bomb dropped on Hiroshima in 1945). Chelyabinsk and Tunguska are the most recent examples of what can happen when an asteroid or comet enters a collision course with the planet. The Earth Impact Database documents 168 asteroid craters of at least one kilometre in diameter, a list that includes the 130km Sudbury impact—the third largest in the world—1.8 billion years ago, and the 150km Chicxulub crater in Mexico's Yucatan Peninsula created 65 million years ago that has been linked to the extinction of the dinosaurs. The database includes six impact craters in Saskatchewan two kilometres or larger—Viewfield, Gow Lake, Maple Creek, Elbow, Deep Bay and Carswell (the biggest at 39km wide)—dating between 75 million and 395 million years ago, as well as the 25km Victoria Island crater in the Arctic that U of S geological sciences professor Brian Pratt helped discover in 2012 while exploring the area for Natural Resources Canada. "It was exciting," said Pratt, who co-authored a paper on the find in the research journal Meteoritics and Planetary Science. "We were flying in a helicopter and we could see the rocks looked strange. So, we landed and walked about 30 yards to the first outcrop of tilted rocks and right away we saw shatter cones. We both looked at each other and said, 'This is a meteorite impact!' That's what creates shatter cones, so we knew exactly what we were dealing with." 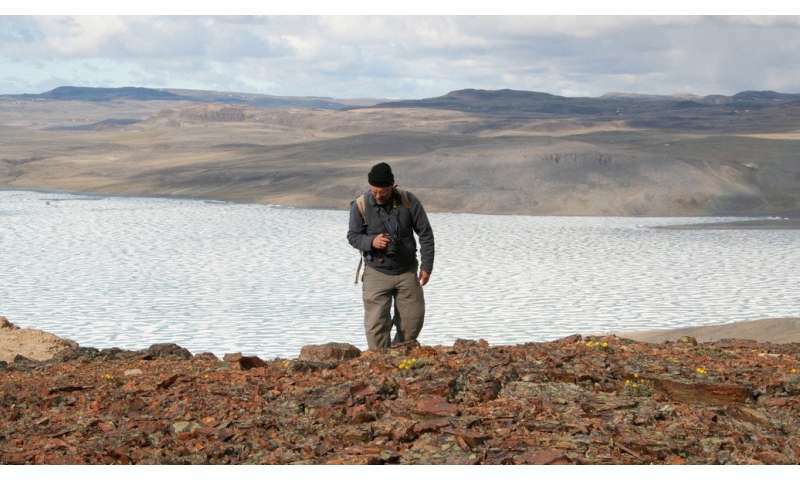 Pratt estimates that impact occurred between 130 million and 450 million years ago and likely had wide-ranging effects. "It could have been a shallow sea when it hit, or it could have hit land, we just don't know for sure," he said. "If it hit land, there would have been an awful lot of debris in the atmosphere that would have affected climate, probably creating a cooling period." While major asteroid strikes are rare in terms of Earth's 4.5-billion-year geological history, even another Tunguska-sized impact would have a devastating effect on a populated area. In the 1990s, Stauffer was a member of the national Meteorite and Impacts Advisory Committee which called on the Canadian Space Agency and the National Aeronautics and Space Administration (NASA) in the United States to identify near-Earth objects (NEOs) and track potential threats to the planet. "They didn't do anything right away, but a few amateur astronomers did and NASA finally took heed and started their program, which I guess I can claim a tiny, tiny bit of credit that our group put the bug in their ear," Stauffer said. To date, NASA has documented 18,043 NEOs in our solar system, including 1,900 that are at least 140 metres in diameter and have orbits near enough to Earth to be classified as potentially hazardous asteroids. But thousands remain undetected. On April 18 an asteroid labelled 2018GE3, estimated at up to 100 metres in diameter, escaped detection by NASA until just a few days before passing halfway between the Earth and moon (192,000km) at a speed of 106,000km per hour. 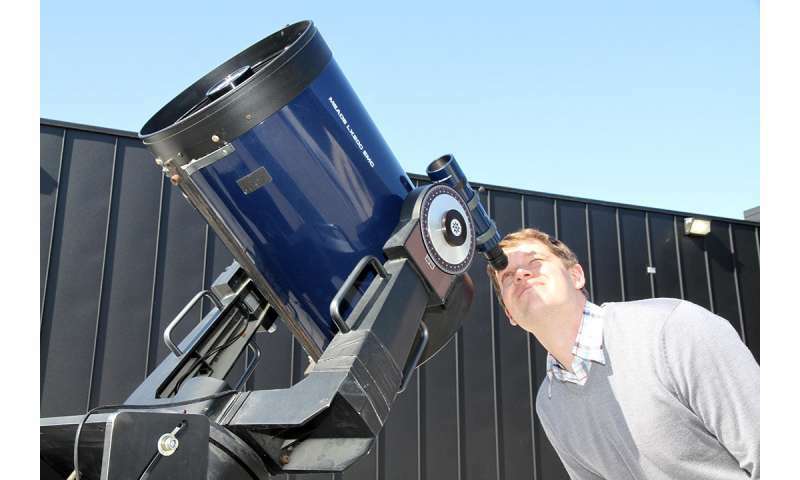 "There are lots of asteroids and comets in our solar system and it's impossible to predict the trajectories of all of these objects, but we need to try," said Daryl Janzen, a U of S sessional lecturer in physics who discusses NEOs in his Astronomy 104 class. Identifying threats is the first step, with the United Nations recently endorsing establishment of the International Asteroid Warning Network for world-wide collaboration to defend Earth from potential impacts. While NASA's official position is that no known asteroid is projected to collide with the planet this century, NASA is preparing for a 2021 space mission designed to demonstrate a kinetic-impact technique to nudge an object off of a collision course with Earth. "There is an extremely low probability of the planet coming into contact with one of these large near-Earth objects in our lifetime, but there is really good evidence that it happened in the past and led to mass extinction on the planet," said Janzen. "So, although the probability is low, it's important to discover as many NEOs as we can, so that if one does enter into a collision course with Earth, we can try to do something about it." Why don't we have swarms of cube sats out looking for NEOs? Another interesting thought experiment is within Neal Stephenson's Seveneaves (2015) where an unknown "Agent" destroys Luna. What a better way to unite the diverse tribes of Terra! Well Sf, where is the profit in launching a fleet of CubeSats to chart the NEO's? We are the "Planet of the Crazy Apes" and we 'looovve' to skate on the edge of extinction. Humanity puts a hell of a lot of effort into proving that big-brain evolution is an evolutionary dead-end. An off the wall suggestion? Crowdsource an infomercial campaign aimed at the 'Movers and Shakers'. To convince them that there is a clear and present danger to their precious hides..
Or? Do as I do to prevent such global catastrophes. Drink to excess. Personally? Rye Whiskey, in copious quantities, is the only only reliable means to self-medicating endless bouts of panic and despair. Af, uhh buddy? You are gushing over the instinct for self-preservation? By some Alien Species, on a galaxy far, far away? Cause the only thing you could get the 'diverse tribes if Terra' to possibly agree upon? Is that their neighbors should be sacrificed to save themselves!